Boondi Curry! Am I sounding weird? no in fact I am not!!! you read it right I am talking about Boondi Kura/Curry. I was lucky enough to taste this wonderful recipe at my cousin sister's place in Vizag. The curry was moist and tasting so delicious. I never in my dreams would have imagine that we can make curry out of Boondi. I simply loved the idea of making curry out of Boondi apart from our regular stuff. What an innovative idea, thanks to my Akka! Heat oil in a kadai/medium pan. Add cumin and sauté for a minute. Add onions, tomato and green chillies and sauté for a min, add ginger paste, garlic paste, turmeric, red chilli powder and salt. Stir so that all ingredients are mixed well together. Add water, cover and let it cook for 5-9 minutes.Once all the water is evaporated, check if onions and tomatoes are cooked. Add boondi and milk, mix well., cover and let it cook for 2-3 mins approx. Serve with hot steamed rice and rasam or dal. 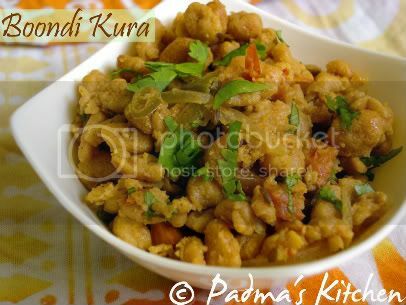 Boondi is my favorite snack and I love boondi raitha so am sure this kura will be yummy - very innovative. my first visit to ur blog and it is too nice! an award is waiting for u in my blog! 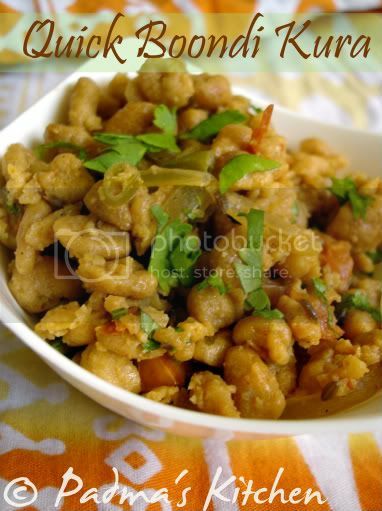 Love the kura..Very creative..Never thought of making a boondi kura before..Lovely recipe..